The Site will not collect any personally identifiable information that is not voluntarily supplied by the user. The Site will not collect any personally identifiable information when you are browsing the Site. Certain actions on the Site require you to provide personal information such as your name, address, telephone number, email address, credit card number, and any other information that is necessary to complete that action, but no personally identifiable information will be obtained other than the information you enter. 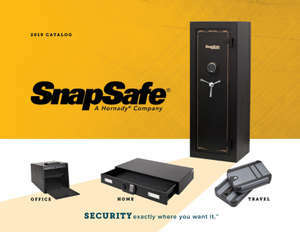 The actions that require your personal information include, but are not limited to, on-line purchase, requests for catalogs or application for membership to SnapSafe clubs. The Site reserves the right to store your name and contact information in a database solely for the reasons set forth below. The Company may contact you via the email address or telephone number you entered on the Site to verify your purchases, as the Company deems to be in your best interest. The Company may also use your email address to send you special offers and/or updates solely relating to the Site. The Company will not use your telephone number or email address for any third party advertisements or notices. If the Company decides to provide email offers, you will have the opportunity to opt-out of any emails by notifying the Company via email at info@snapsafe.com or via telephone at 1-877-214-4470, or by selecting the “unsubscribe” link embedded in the email message. The importance of security for all of your personally identifiable information is of utmost concern to the Company. The Site exercises great care in providing secure transmission of your personal information. Secure socket layer (SSL) encryption is used for all credit card transactions. In addition, firewalls and other security enhancements are utilized by the Site to help protect your personal information. While we strive to protect your personal information, SnapSafe cannot ensure or warrant the security of any information you transmit to us, and you do so at your own risk. ID (Address) Verification: We use third-party software to verify a user’s mailing address.